Largo Film Awards is a seasonal international event. We accept short films, documentaries, animations, and web series of any genre. Each season (2-3 months) our jury members, who are formed by the industry specialists, watch, review, and rate for the submitted films. We announce the official selection of the season at the start of following season on our website. Next, with a second cycle of reviews, the winners of the seasons are announced at each category. We do not organize screenings for the seasonal events. But every two years, we publish a volume of Largo Journal in which the winners from seasonal selections are introduced in detail. 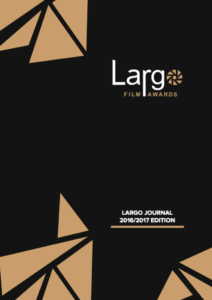 Largo Journal is distributed to a large film network. The goal of Largo Journal is to introduce new filmmakers to the film industry. In the collaboration with Sofy.tv, we help you to distribute your short film. We add the best films from Largo selection to our curated pages created in a collaboration with Sofy.tv.